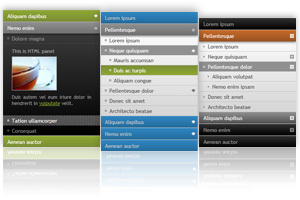 HTML5 Accordion Menu is distributed as an Adobe Dreamweaver extension, packed as a file, named JQAccordionMenu.mxp. Read more in the online help. HTML5 Accordion menu provides an intuitive and eye-catching navigation on your site and can improve the look and appearance of a site as well as the usability. Transition easings effects and beautiful hover animations provide the menu with great appearance. More over you can add a HTML panel as a menu item, where you can add your images, text or any other html code. Menu can work in two modes: as an accordion menu or as a collapsible slide menu. Component is fully browser compatible, and will work on iDevices like iPhone and iPad! CSS based which makes drop down menu search engine friendly, as all menu links, text and titles are placed directly on pages in plain HTML, absolutely accessible to search engines. You don't need to be an expert in web design and to know programming languages to add navigation for your site. Accordion Menu is powered by jQuery and it has clear and comprehensible user interface, you can easily set up, change appearance and edit the content of the menu without digging into CSS files! Component is ready to work as soon as it appears on a page and is fast to respond. The installation package contains Dreamweaver extension, providing you the ability to easily create high-impact, HTML5-powered menus, all in Dreamweaver CS3, CS4, CS5, CS6, CC 2014, 2015, 2017 and CC 2018. 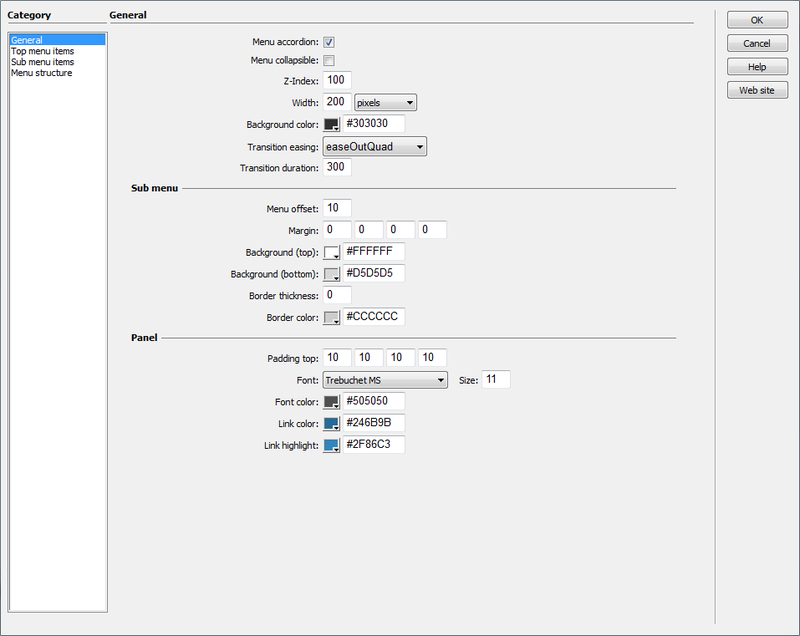 Using the user-friendly interface, you can adjust all colors, fonts, sizes, spacing, and a wide range of options including more than 50 parameters that you can adjust according to your taste. There is no need to dig into CSS files to make some changes in menu style. All colors, fonts, sizes, spacings, everything - can be changed to fit the look and feel you want with few comprehensive clicks. You can add HTML panel as a menu item, where you can add images, text and any ohter html code. You can easily create necessary menu navigation using menu structure editor. Through the menu editor you can add or remove items from menu, move them up, down, left (level up) or right (level down). Menu is based on unordered list, semantically correct links structure is considered to be the best Search Engine Optimization solution for navigation menus. Menu has different easing effects of sub item expanding and beautiful hover animations for menu items. Menu item can have three different states: Active, Normal and Highlight. Installation package contains Dreamweaver extension. Dreamweaver extension allows you to easily create HTML5 navigation menus. Extension has user friendly interface. There is no limit on the depth of sub menu which drops down over the html content.